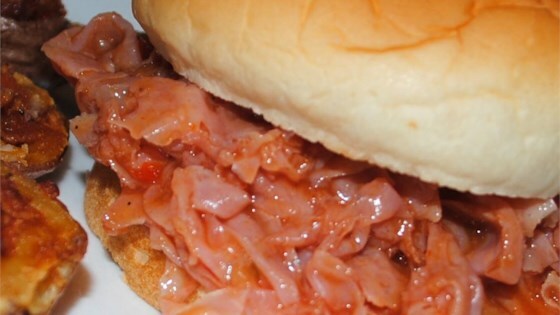 This is my grandfathers recipe for Chipped Ham Barbecue. Chipped Ham is extremely thin sliced ham from the butcher or meat department at your local supermarket thats a big staple of Pittsburgh. It’s almost like a Sloppy Joe except the meat isn’t ground up like a chili. You’ll want to get regular or smoked ham, not the maple or flavored kind as it will throw off the taste. Finding chipped ham is easy, you can usually just ask the butcher or deli for them slice it on the smallest setting they have. In a large sauce pan, saute chopped Onion and chopped Garlic in Oil. Add Tomato Soup, Water and Ketchup stirring after adding each. Add Vinegar and Brown Sugar. Stir until all ingredients are well combined. Chop the Chipped Ham into bite size pieces. Stir in the chopped Chipped Ham until well coated. Let simmer 1.5 to 2 hours, stirring occasionally. If sauce seems too thick, add additional 1 or 2 Cups of Water. After 1.5 hours, test meat to see if soft and flavorful. Once meat is soft, either allow to cool naturally to store for future use or move to crockpot on low heat setting. A big batch of this is pretty cheap and will feed you good for a few days. Just throw some in a bowl, heat in the microwave for a few minutes, toss on a bun and enjoy with a cold beer.